2017 Update: this archived post was originally written in 2014, based on data from 2013. The cost of building has increased since it was originally posted. Costs per square foot are higher now, so please be aware, although the relative cost of building in Colorado as compared to other regions of the USA has generally remained the same. One of the most common questions we get when people are interested in building a custom home here in Colorado is “how much does it cost per square foot?” While this can be a loaded question due to many variables (i.e. whether you want a one-story or two-story floor plan, the level of finish, your need for well and septic or city water/sewer), over the years, we’ve crunched the numbers and we’ve found that in Colorado Springs, it costs, generally, somewhere around $110-120 per square foot to build a custom home. (This cost, of course, excludes the cost of the land you build it on). I was curious how this stacks up with other regions across the nation, so I dug around to see some comparable numbers. 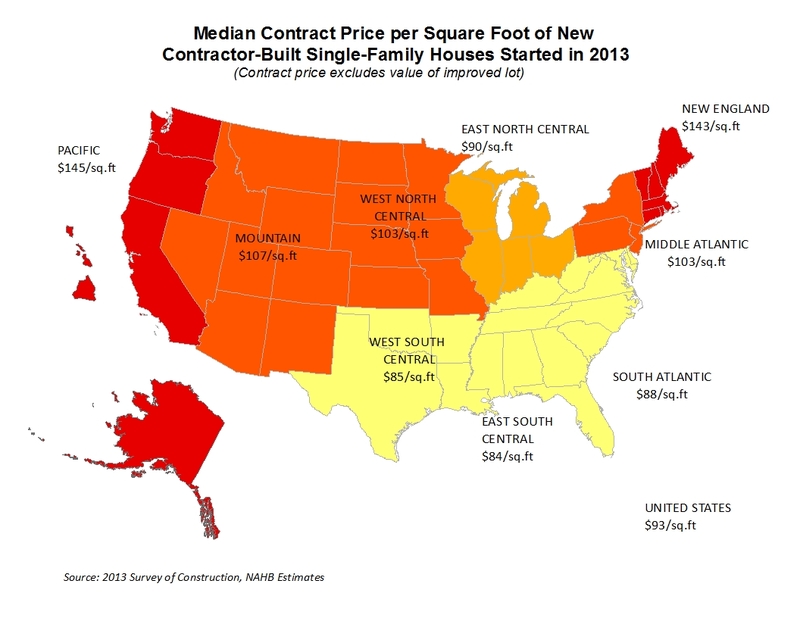 This great chart just released by The National Association of Home Builders shows how custom home building costs across the USA (see below). Once we look at these numbers, it all makes sense: we’ve been building homes for people moving here from the West Coast for a long time—the cost of living out there has gotten outrageously high and many, many people have moved from California to Colorado—(including three out of the four people in our own company! )—mostly due to the fact that it’s easier to live here, and the cost of living is much more reasonable. 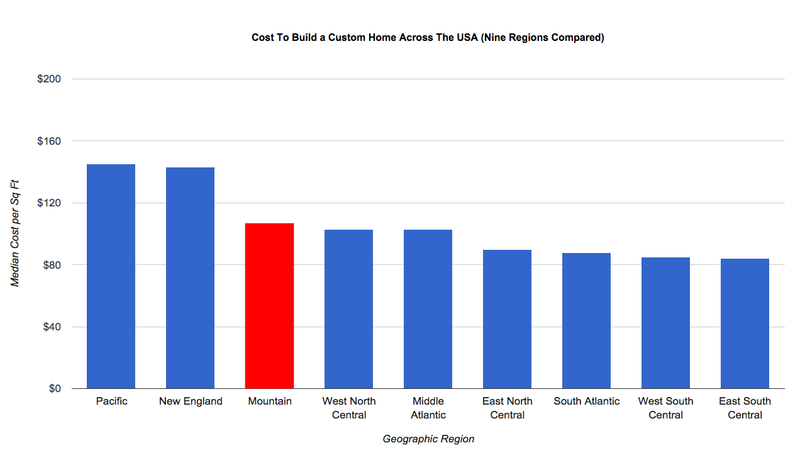 While it’s true that the chart shows that the cost of building a custom home in Colorado is higher than five other regions, I think it’s worth making two observations: #1) the third, fourth, and fifth regions are nearly the same, and #2) people don’t generally move from the Mountain Region to those eastward regions… the statistics show that people are generally moving from the east and west coasts, to Colorado. (Especially from the East South Central region, where many families are picking up and moving here to the mountains to escape the heat, bugs, and humidity). If you’re one of the many people who would like to join the migration and relocate to the mountains, we would love to build you a beautiful custom home that fits you perfectly. Whether you want to move down to a smaller home, or upgrade to a larger home, we can build you just about anything. Feel free to contact us for more information, or request a quote. We’d be happy to talk to you about building your home, and we’d be happy to give you a cost estimate that we think you’ll be pleased with. And remember, the building costs out here are right in the middle, but we think we come out on top when it comes to quality of life! Come join us and see why. Very helpful site, Ron. I think custom building one’s home is the way to go, after spending three hours on Zillow and seeing the cookie-cutter-model homes that seem to have been built row upon row in your beautiful state. My question is, “Since there seem to be very few one story later model homes, why don’t more people just go custom?” You don’t have to undo everything you don’t like that the last homeowner chose. BTW, here in our Southern California town, homes run $750sf if you buy, and if you build that cost is $250-350. Sadly, between these costs and the exorbitant cost of land and building materials here, all the young families are saying, “So long, California!” We’ll be contacting you if we do decide to leave. Thanks Nana! Yeah, California prices are totally off the charts. It’s much more affordable (and arguably as beautiful) here in Colorado. Would your company build a one level, 600 sq ft, apartment, near downtown, as an accessory structure?